Demo: Kein Gerede nur die Tat! Liebig 14 verteidigen! 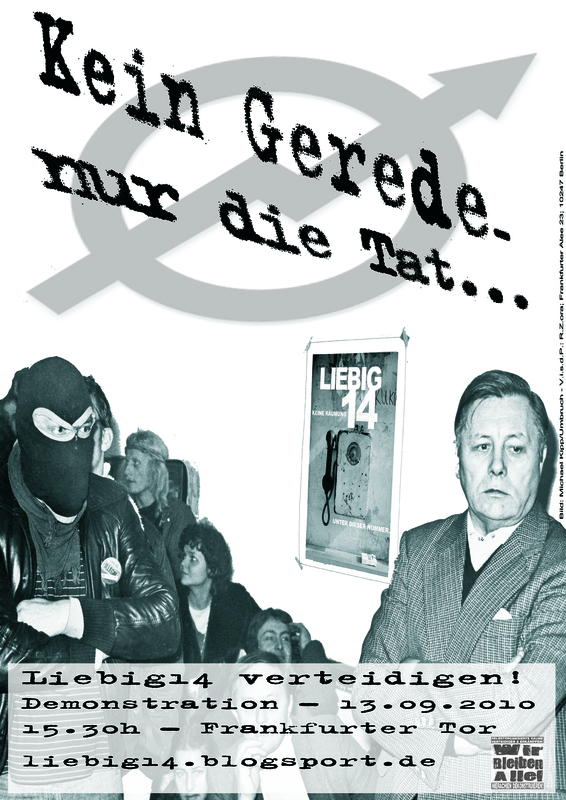 “No speech, just action…” Defend Liebig 14! The struggle against eviction continues for the house project Liebig 14. The threat of eviction has been hanging over the project since the house rental contracts were cancelled after a lengthy legal battle with the landlord in November last year. From January 2010 we attempted to secure the project through a series of roundtable meetings initiated with district politicians and representatives of local associations. So far however no concrete solutions have been forthcoming from these meetings. Instead of aiding us in their capacities as politicians and “decision-makers” the roundtable participants have claimed to be unable to intervene in what they see as a private dispute. We however see the politicians refusal to act as evidence of a lack of political will to safeguard alternative living and cultural projects in Berlin. It has therefore become increasingly clear to us that they will offer little help in securing the future Liebig 14. As a result we have called for a final roundtable meeting in order to bring an end to these futile negotiations. We are not only placing blame for the current situation on those involved directly in the roundtable meetings but also, and especially, the house owners S. Beulker and E.Thöne, Berlin Senate politicians and finally representatives of the Liegenshaftsfonds who withdrew from their responsibilities despite our repeated requests for a replacement living space. Again we see here the crux of the issue: politicians shirking responsibilities by claiming that Liebig 14 is involved in a private legal dispute rather than admitting to their failures in city policy-making. On the 13th of September, during the Intersquat Festival, our final attempt to find a solution through a roundtable meeting will take place. When no solutions are proffered at this meeting we will find ourselves forced to build up the political pressure our situation deserves through other means. We can no longer wait for the decisions and actions of those who claim an interest in our situation but lack the backbone to take concrete steps in our defence. We have had enough of living with the daily fear of a brutal police eviction. We will take things into our hands. We will work together to build public discussion and political pressure around this problem through actions – and for us “the problem” is not only the threat faced by Liebig 14, nor even the failure of city policy but capitalist society in all its manifestations. To this end we are calling a demonstration at 15:30 on the 13th of September to coincide with the final roundtable, under the slogan “No speech, just action…”! Demonstration begins at Frankfurter Tor. Support the demo and stay creative! For demo route and further info check the blog and twitter account in the coming days! 4 Antworten auf „Demo: Kein Gerede nur die Tat! Liebig 14 verteidigen! 1 Demo: Kein Gerede nur die Tat! Liebig 14 verteidigen!